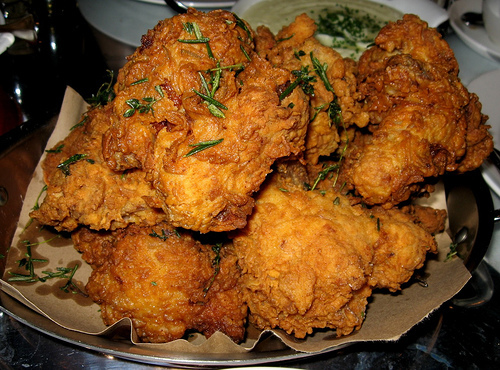 Buttermilk fried chicken. Photo by arnold | inuyaki. Can you think of any Southern food more Southern than fried chicken? The staple of every Southern restaurant, the favorite meal at your grandmother’s table, the way it complements everything from mashed potatoes to green beans—fried chicken is a classic Southern dish, whether it’s made at home or at your favorite Southern restaurant, for a family dinner or a picnic. All Southern cooks worth their weight in yams know that there are a few tricks to making the perfect fried chicken. Here’s a look at what counts when it comes to the marinade, breading, fry style, and side dishes. There are many options to choose from when marinating chicken, from a tangy barbeque sauce to an herbed butter glaze, or (my preference) a spiced buttermilk. Buttermilk softens the chicken for that fall-off-the bone quality you’ll love, while also helping those all-important spices, like paprika, chipotle, cayenne and salt, flavor the meat. Soaking chicken (skin on, bone-in) overnight in buttermilk and spices gives it a wonderful texture and flavor. Chicken is a blank slate for whatever seasoning you use, so for mouthwatering fried chicken, focus on the spices. Marinades are only half the equation. Once the chicken has been primed, it must be wrapped in a flaky, flavorful and—most importantly—crisp outer layer. To achieve this, the breading is broken into three parts: the flour dip, the egg dip, and the bread dip. First the chicken, wet from the marinade, is dipped in a mixture of flour and spices. Then it’s dredged in a bowl of whisked eggs. Finally, it’s dipped into a combination of breadcrumbs (big and small), flour and spices (again). These layers ensure that the breading will last through the frying process so that you get those perfectly crispy and flavorful results. Any fried chicken enthusiast will tell you: there’s a big debate over pan (or shallow) fried chicken and deep fried chicken, and which method of frying produces the best results. Pan-frying chicken can make for inconsistent results, like unevenly cooked meat, and it’s also time-consuming to make. On the other hand, it provides a perfectly crispy crust and a depth of seasoning that is unparalleled. Deep-frying chicken is quick and easy, and produces even results, but the flavor and character can get lost in the convenience. Ultimately, both are delicious, but my opinion? Take the time to pan fry. You won’t be sorry. You wouldn’t be the first person to make a meal out of fried chicken by itself, but it wouldn’t really be Southern without some accompaniments. The best fried chicken is only improved by its accompanying side dishes. You’ll need at least one veggie and one starch. Classic veggie pairings for fried chicken include green beans, fried okra, coleslaw and collard greens. For starches, you can’t go wrong with cornbread, grits, mac-and-cheese or mashed potatoes. Making and eating fried chicken is an art. With this guide you’ll be in fine fried form! Editor’s Note: Where’s the best fried chicken you ever had? What are your fave fried-chicken sides? Elena Rosemond-Hoerr is a photographer and writer based out of Baltimore. Born and raised in North Carolina, Elena writes about Southern food culture, blending stories and recipes to bring a piece of the South to everyone. You can find her delicious recipes on her blog, Biscuits and Such, and follow her food musings on Twitter @biscuitsandsuch.